Dr. Ben Burden was psychologist at the University of Exeter who was a pioneer in the exploration of self-concept and self-esteem in students with dyslexia. After interviewing hundreds of dyslexic primary and secondary school children about their school experiences, he found out that self-efficacy or a belief in one’s ability to succeed was just as important if not more important than early identification and school remediation in terms of eventual life success. It is not an accident, we think, that being told that dyslexia was his super power had such a profound effect on how O’Leary viewed himself and ultimately changed the course of his life. 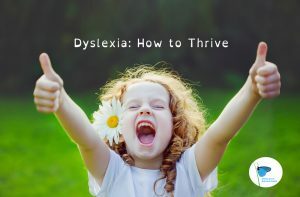 Our book, The Dyslexic Advantage provided a breakthrough for many people because the positive side of dyslexia is not shared enough with the people who need it most. For Premium members below, we’ll share parent and teacher tips for fostering self-efficacy and self-esteem in students with LD. The first 3 factors are: 1. Accurate perception of one’s strengths and weaknesses as a learner. 2. Strong belief in self-efficacy (I can do this). 3. Strong internal locus of control (I can control my life and am not controlled by my environment or fate).